Understanding correctly how to use a yellow box junction and it’s rules is important as they are designed to keep traffic flowing. Blocking a box junction can result in a penalty as certain junctions use detection cameras for such purposes, and of course, inappropriate use of a yellow box junction will fail a driving test. This tutorial will guide you for stopping at a box junction, turning right at a box junction and gain an understanding of yellow box junction rules. Box junctions are often in place at busy areas where traffic flow is crucial. A yellow box with crisscross lines in the junction indicates a yellow box junction. this tutorial is following the red car turning right on the yellow box. If your driving test involves the use of box junctions, you will need to approach them exactly the same as any other junction by using the MSPSL routine, in this case, for Turning right at a junction. A question frequently asked is ‘can you stop in a box junction?’. The answer is yes, but a yellow box junction must not be entered unless your exit road is clear. If you do stop in a yellow box junction and your exit is not clear, you are committing a road traffic offence as you will prevent other vehicles from making progress and bring the entire junction to a standstill. If entering a box junction during your driving test when the exit is not clear, this will be an instant test failure. Other than failing the test and making other motorists angry, it is also illegal. The red car in the centre of the diagram is turning right at this crossroads junction. The red car is stationary waiting in the yellow area on the box junction as it is waiting for oncoming traffic (the yellow car) to pass. The cars exit road on the right is perfectly clear. 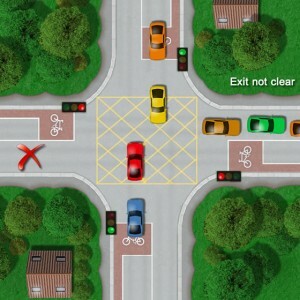 When the oncoming traffic has either passed the crossing, or stopped moving due to the traffic lights changing to red, the red car can proceed to clear the crossroads without blocking the junction and impeding the progress of others. 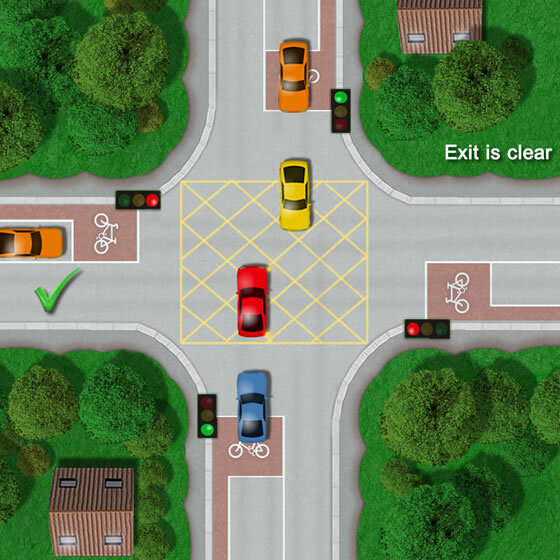 It’s important that you are sure the exit you intend on taking is clear before proceeding into the yellow box area – not just if you’re turning right. Ensure you clear the yellow box even if your traffic lights have changed to red. A similar diagram again with the red car in the centre waiting to turn right. On this occasion the red car has entered the yellow box junction area, but this time the red cars exit is not clear. If the cars exit does not clear in time, he will be blocking the junction and the progress of motorists. This situation also applies to vehicles traveling straight instead of turning right; the box junction must remain clear.